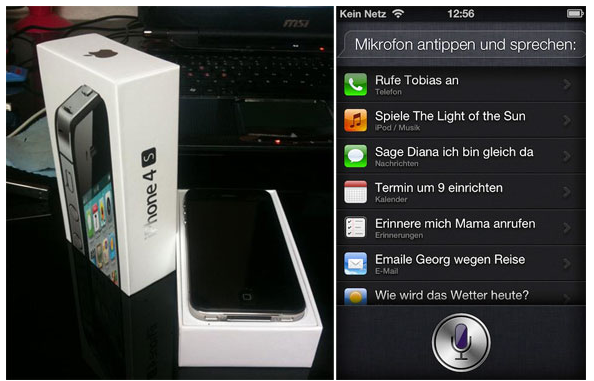 So finally the first iPhone 4S deliveries start arriving at the doors of the customers, some lucky German customers has reported that early morning they received their new Apple’s iPhone 4S and publishes couple of pictures of the device to approve the claim. After this earlier deliveries of the device, a large group of people start knocking the carriers to give them their new iPhone 4S, from the earlier information leak of the device. We learn that the new iPhone 4S is 68% faster than iPhone 4 and in Graphics performance its shoot down the Apple’s iPhone 4 by producing 7x fast results. The iPhone 4S is officially scheduled to debut on October 14th, Friday. If you have missed the iPhone 4S pre-orders and now want to get hands on the latest device, the only way to get the device is visit the Apple Store and stand in line for the device on the launch date.